In the early hours of 15th May 1999 St. Peter’s was subjected to an arson attack which severely damaged the interior of the building. The perpetrator broke into a side window and lit several fires which, once the oxygen in the church had been largely used up, smouldered for several hours. 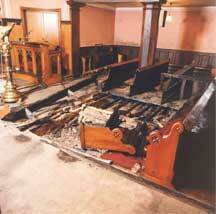 The damage to the interior was extensive with the front rows of pews in the south centre aisle burned out completely and the walls, furniture and fittings covered in a tar-like deposit because of the low intensity of the fire. The Select Vestry of St. Peter’s met to discuss what should be done. Bravely and with great faith the Vestry decided that they would not simply repair the damage caused by the fire but would completely restore both the exterior and the interior of the church, replacing the roof, rewiring, installing a new heating system, restoring the organ, repairing, restoring and repointing the stonework, and saving this unique piece of Ireland’s architectural heritage so that it may be handed on to generations yet to come. 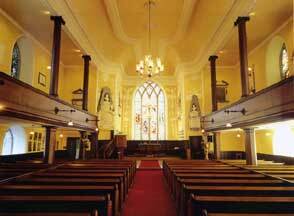 But not only would the church be restored, it would also be made into a superlative performance space, one which would attract the best national and international artists and have musicians from across the globe bring a diversity of programmes and performances to Drogheda audiences, while all the while remaining first and foremost a living, active place of Christian worship. Finally the parochial hall, which was in a seriously dilapidated state, would be demolished and a new centre built on the site to not only provide facilities for the parish and the rest of the community but to also complement the wider use of the church. 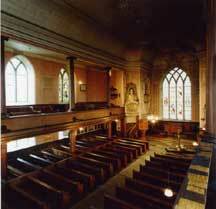 The project was broken down into two phases: the restoration of the church and the building of the new hall. Phase 1, the church, was costed at circa Euro 1 million and would take three years to complete. Phase 2, the hall, was also costed at circa Euro 1 million and would take a further two years. Phase 1 was completed on time and in budget and was celebrated in September 2002 at events to mark the 250th anniversary of the original dedication of the church in 1752. Phase 2 was delayed by planning considerations and demolition and construction of the new hall did not get under way until September of 2006. It was completed at the end of September 2007. Since the completion of Phase 1 a full-size Steinway concert grand piano was purchased through a fund-raising drive and generous grants from the Arts Council and Drogheda Borough and Louth County Councils and is housed in the church. Many first-class musical events have been held featuring local, national and international artists and the parish has been delighted to host the widely acclaimed Drogheda Borough Council’s International Music Series for the past four years. The congregation of St. Peter’s give thanks to Almighty God for the support which was received in response to the dreadful events of May 1999. Without the generosity of many people in Drogheda and beyond, the grants which we received from several funding bodies, the support of other congregations within the Church of Ireland, the Roman Catholic Church, the Presbyterian Church and others, and the hard work and dedication of so many people none of this ambitious project would ever have been realised. It is to Almighty God, all of them and to those generations yet to come that this work is dedicated. In the Gallery section of this website, images can be seen some of the damage done to the church, work in progress and the restored interior of the church during the Restoration Programme and the new parish hall construction. An on-line version of the appeal brochure which was produced for St. Peter’s Heritage and Arts Project is available.